Below you can learn about many cardiovascular conditions we diagnose and treatments we provide at the Nazeri Heart Center. You will also find links to patient education resources that Professor Nazeri recommends. To schedule an appointment, please call us at (+9821) 88 870 9923. For more information on our office hours, location, and billing policies, please visit our Contact Us page, complete with an online contact form for further questions. The aortic valve is a three-leaflet valve that sits between the left lower chamber of the heart (left ventricle) and the aorta (large artery that carries the blood out of the left ventricle to the rest of the body). The aortic valve may become narrow and fail to open appropriately, which is called aortic stenosis. This can be due to aging, rheumatic heart disease, infection, or congenital heart disease. Depending on the severity of the narrowing, aortic stenosis can cause shortness of breath, chest pain, syncope (passing out), or even sudden cardiac death. There are two types of treatments used for aortic stenosis patients: open heart surgery, during which a surgeon will replace the diseased valve with an artificial valve, and transcatheter aortic valve implantation (TAVI) or transcatheter aortic valve replacement (TAVR). Open-heart surgery is a major surgical operation and is rarely used anymore. TAVI and TAVR are newer minimally invasive procedures that allow Professor Nazeri to implant a new aortic valve without surgery. Our patients are able to recover faster and have a much lower risk of complications. 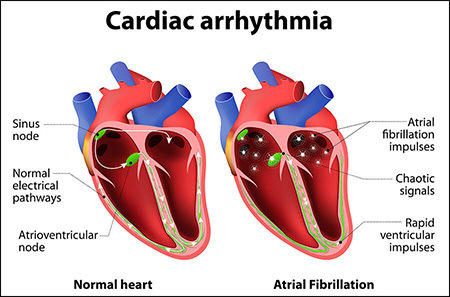 Atrial fibrillation is a type of heart arrhythmia. Patients with atrial fibrillation often feel irregular, rapid heart rates. Atrial fibrillation can occur at any age, though its occurrence is higher in elderly patients. Younger patients with thyroid hormone imbalance, uncontrolled hypertension, heart failure, obesity, and/or sleep apnea are at an increased risk of developing atrial fibrillation. Symptoms of atrial fibrillation, often called AFib, include chest fluttering and palpitations, shortness of breath, chest pain, weakness, and lightheadedness. Some patients may not experience any symptoms, and their atrial fibrillation is diagnosed during diagnostic testing for heart failure or stroke. AFib episodes can last from minutes to days. In some patients, it may come and go frequently or stay for long periods of time. Lasting episodes require treatment. Atrial fibrillation can lead to serious complications including stroke. All patients with symptoms of atrial fibrillation need to be evaluated by a heart doctor. Nazeri Heart Center offers medical services such as catheter ablation treatment for atrial fibrillation to help manage the condition, as well as drug therapy with blood thinners to decrease your risk of having a stroke. 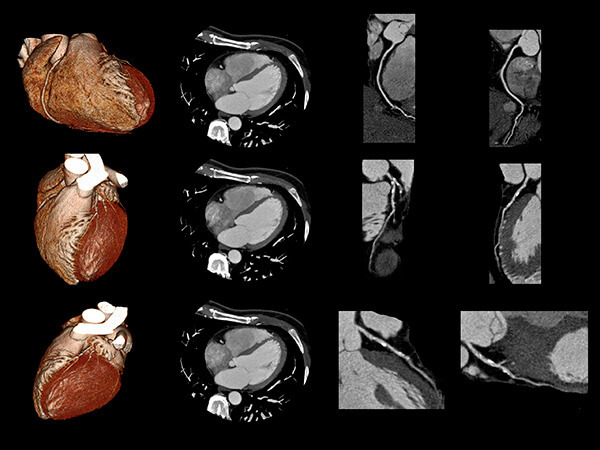 A cardiac computed tomography (CT) scan, or heart CT, is a noninvasive test using X-ray to take detailed pictures of your heart arteries and other structures. During your procedure, you will be injected with an iodine-based contrast in order for Professor Nazeri to view your coronary arteries. This is also called coronary CT angiography. We offer cardiac coronary CT angiography and calcium scoring testing with the 64-slice CT scanner. Prof. Nazeri uses heart CT scans to detect coronary artery disease (narrowing or blockages of heart arteries) and/or detect calcium buildup in arteries, which can be an early sign of arterial disease. He is the leading cardiology expert offering this testing and has published extensive research about how this test can be used to identify blockages in arteries and other heart structures. A cardiac stress test is a noninvasive test used to evaluate possible blockages in your heart arteries. Professor Nazeri may recommend this test if he suspects you are suffering from significant coronary artery disease. This test involves exercising under physician supervision, either on a treadmill or riding a stationary bike, to obtain information about your heart function during exercise. Your doctor may also combine the stress test with a complementary imaging test such as a real-time echocardiogram (stress echocardiogram) or a nuclear stress test (taking a picture of your heart with a special imaging camera). Chest pain or chest discomfort presents in many different ways. It may feel like a sharp stab, a dull ache, or a crushing or burning sensation. Sometimes the pain travels to the neck or into the jaw, or it radiates to the back or arms. Although different problems can cause chest pain, the most life-threatening ones are related to the heart or lungs. Angina occurs when chest pain is caused by reduced blood flow to the heart muscle and is a symptom of coronary artery disease. Angina is usually described as a dull pain, squeezing, pressure, heaviness, or tightness in your chest. This is a very important sign of heart attack. 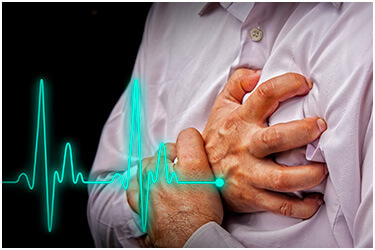 It is hard to distinguish the exact cause of chest pain which is why Prof. Nazeri recommends you seek medical attention immediately to identify the cause of your chest pain. Coronary angiography, also called diagnostic coronary catheterization, is a procedure to identify the presence and severity of blockage in the coronary arteries, which supply blood to your heart muscles. Professor Nazeri performs coronary angiography in a catheterization laboratory (cath lab) at one of our affiliated hospitals. During your procedure, tiny catheters are inserted into your heart arteries, usually through a femoral artery (leg) or a radial artery (hands). A special solution called contrast is injected to allow Prof. Nazeri to evaluate your arteries under X-ray (fluoroscopy). If the coronary angiogram shows significant blockages, Prof. Nazeri will recommend you have a coronary angioplasty or coronary artery bypass surgery to restore blood flow. Prof. Nazeri is Iran’s leading interventional cardiologist. He performs coronary angiograms, coronary angioplasties, and stenting to treat coronary artery disease in one of our affiliated hospitals equipped with state-of-the-art cardiac catheterization labs. Coronary angioplasty is performed to open clogged heart arteries. During this procedure, Prof. Nazeri will insert and inflate a tiny balloon where your artery is clogged and narrowed to help reopen the artery. After opening the artery, Prof. Nazeri will often place a permanent small mesh tube called a stent to keep the artery open and prevent it from clogging again. Coronary artery bypass grafting surgery (CABG) is a surgical procedure to restore blood flow to your heart muscles. During this procedure, a cardiac surgeon will use veins from your legs or hands to make a connection, which bypasses the blocked area of your artery. Coronary arteries are the major blood vessels that supply blood to your heart. Through these arteries, your heart receives oxygen and nutrients. Plaque (cholesterol deposits) and inflammation in your arteries are usually the cause of coronary artery disease, or atherosclerosis. Plaque build-ups will cause significant narrowing of the coronary arteries and subsequently decrease blood flow to your heart. The decreased flow can cause chest pain and discomfort (angina), shortness of breath, jaw pain, and/ or left arm pain, which can occur at rest and during active periods. Plaque can take decades to build up and may not present any warning signs until you have a heart attack, which occurs when plaque and inflammation cause complete arterial blockage. There are many ways to evaluate your risk of coronary artery disease (CAD) and prevent a heart attack, about which Prof. Nazeri can educate you. Risk factors are the known factors that increase your risk of coronary artery disease. Tobacco use: Any type of tobacco use will damage the wall of the arteries, allowing the deposit of cholesterol, which subsequently causes blockages in the arteries, leading to a heart attack. Tobacco use includes chewing tobacco, smoking, and long-term exposure to secondhand smoke. Diabetes: Uncontrolled diabetes significantly increases your risk of plaque development and CAD. High blood pressure: Uncontrolled blood pressure damages arteries over time and accelerates plaque formation, which leads to blockages of the arteries. High blood cholesterol or triglyceride levels: Cholesterol deposits are the major cause of narrowing of heart arteries. Higher than normal triglycerides, a type of blood fat related to your diet, is also not desirable for your heart health. Age: Women over 55 and men over 45 have a greater risk of CAD than younger adults. Sedentary lifestyle: Lack of exercise increases your risk of coronary artery disease, as it contributes to uncontrolled blood pressure, diabetes, and obesity. Obesity: When you are overweight, your heart has to work harder to supply blood to your tissues. Obesity also causes high blood pressure, diabetes, and high cholesterol. Family history: If one of your male first degree relatives (brother or father) suffered a heart attack before the age of 55, or your female first degree relative (sister or mother) suffered a heart attack before the age of 65, you are at increased risk of developing coronary artery disease. It is important to identify your risk of coronary artery disease. Most of the major known risk factors can be controlled, such as high cholesterol, high blood pressure, and diabetes. Proper treatment may even eliminate certain health conditions that raise your risk, thereby significantly lowering your chance of heart disease. You can visit Framingham Coronary Heart Disease Risk Score to calculate your risk of developing coronary artery disease. Prof. Nazeri recommends everyone over the age of 30 have a baseline evaluation of their risk factors, no matter your risk score, as well as anyone with a calculated risk equal to or above 10 percent. 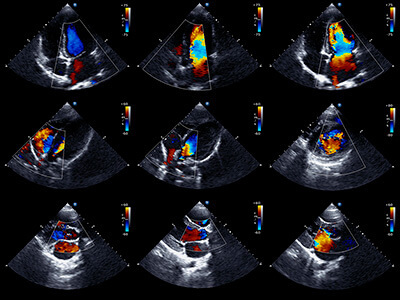 An echocardiogram is a noninvasive test that uses ultrasound technology to evaluate your heart function. The sonographer will use an ultrasound probe on your chest to take images of your heart, which will display heart muscle and valve function in real time. This test is commonly called a transthoracic echocardiogram when it is performed on your chest wall. Every heart beat starts from an electrical signal in the upper right chamber of your heart, which transfers to the rest of your heart muscles generating your heart beat. 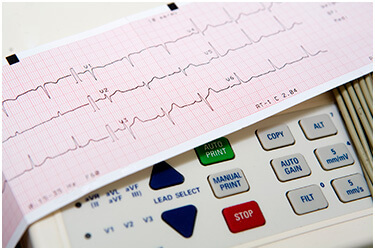 An electrocardiogram, also called EKG or ECG, is a noninvasive test that records the electrical activity of your heart to diagnose heart disease. An electrophysiology study (EPS) is a test to evaluate electrical activity of your heart and help your doctor identify the cause or causes of your heart rhythm problem (arrhythmias). The procedure takes place in a special operating room called an electrophysiology lab or a cath lab in a hospital. During this procedure, an interventional cardiac electrophysiologist will pass three to five small catheters through your veins, usually through the groin area, and place them in different areas of your heart while you are mildly sedated. Using a highly specialized machine, he or she will test and assess the electrical system of your heart. Based on the test results, we may recommend a pacemaker, implantable cardiac defibrillator, or an ablation for your heart rhythm problems. Catheter ablation of arrhythmias is a procedure that will usually be done following the EPS to treat certain arrhythmias. During this procedure the physician will use a specialized catheter with a small heated tip to burn the area of the heart that causes the arrhythmias. The success rate of this procedure to eliminate the problem is dependent on the type and area of the heart that the arrhythmias come from. The heart is a complex, fascinating organ. Learn all about the structure and physiology of the heart. Heart arrhythmias are problems with your heart rhythm that happen when normal electrical impulses of your heart don’t work properly. You may feel that your heart is beating too fast, too slow, skipping beats, or otherwise beating irregularly. Common symptoms include chest fluttering and palpitations, although you may feel lightheadedness, dizziness, shortness of breath, or chest pain. Heart arrhythmias can be frequent and bothersome, and some can be life threatening. We recommend you consult with your heart doctor, Prof. Nazeri, if you have any of the above symptoms. Nazeri Heart Center offers comprehensive evaluation and treatment services to patients suffering from heart rhythm problems. 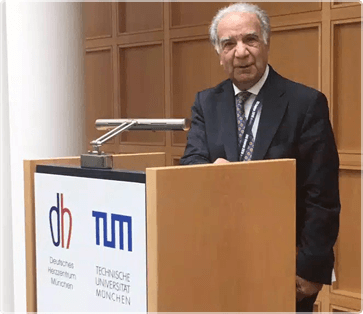 Prof. Nazeri was the pioneer of device management for cardiac arrhythmias and was one of the leading cardiologists who started pacemaker implantation in Iran decades ago. 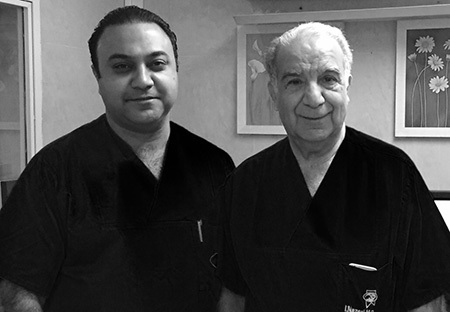 Under the close supervision of Prof. Nazeri, our team of world-renowned interventional cardiac electrophysiologists implants pacemakers, cardiac defibrillators (AICD), and biventricular ICDs. 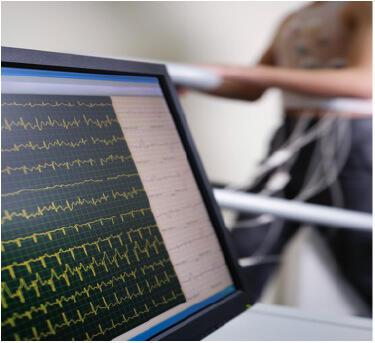 We also provide electrophysiology studies and ablation services to our patients suffering from heart arrhythmias including supraventricular tachycardia, atrial fibrillation, atrial flutter, and ventricular tachycardia. Heart rhythm monitors, also called Holter or event monitors, are wearable monitors that continuously record the electrical activity of your heart. A regular EKG only records your heart rhythm at rest and during the test period, whereas a heart rhythm monitor allows Prof. Nazeri to detect any heart rhythm problems you may have during daily activities. He may recommend you wear a monitor for a couple of days, or up to a month, while he monitors your heart activity. Certain heart rhythm problems (arrhythmias) are life threatening and can cause sudden death if not treated quickly. These arrhythmias usually come from the lower chambers of the heart and are called ventricular arrhythmias. During arrhythmias, your heart cannot function properly and the blood flow to essential organs, including your heart and your brain, is disrupted. 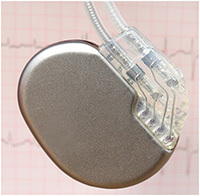 An implantable cardiac defibrillator (ICD), or automated implantable cardiac defibrillator (AICD), is a device that is placed under the skin of your chest and connects to your heart muscles with wires. An ICD will monitor your heart rhythm continuously to detect ventricular arrhythmias. The device will try to correct an arrhythmia by shocking your heart back into rhythm. Prof. Nazeri may recommend an ICD if you already have or are at high risk of having ventricular arrhythmias due to an underlying heart condition such as heart failure. A pacemaker is a device (small battery) that can be placed under the skin of your chest and connects to your heart muscles with wires. A pacemaker is used to treat certain heart rhythm problems such as a slow heart rate or heart palpitations, which can cause tiredness, shortness of breath, dizziness, lightheadedness, and fainting. The pacemaker will help the heart to beat normally. By controlling symptoms, you can resume a more active lifestyle. The mitral valve is a two-leaflet valve located between the left upper chamber of the heart (left atrium) and lower left chamber of the heart (left ventricle). The mitral valve may become narrow and fail to open appropriately, a condition called mitral stenosis. This can be due to advanced patient age, rheumatic heart disease, infection, or congenital heart disease. Depending on the severity of the narrowing, mitral stenosis can cause shortness of breath, chest pain, syncope (passing out), or even sudden cardiac death. There are two ways to treat mitral stenosis. One is for a heart surgeon to replace the valve with an artificial valve. The second option is called mitral valvuloplasty, where Prof. Nazeri uses a special balloon that is inflated inside the narrowed valve. 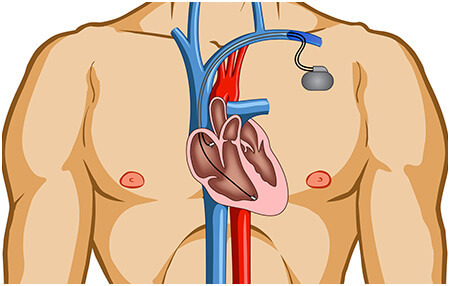 This procedure will widen the valve and lead to resumption of its appropriate function without major surgery. 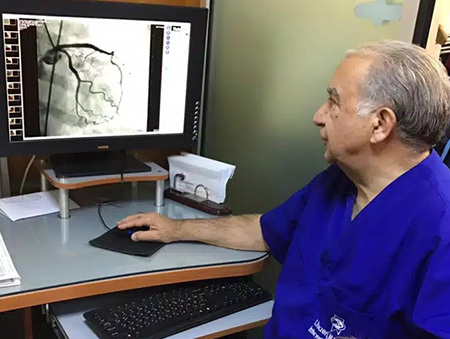 Professor Nazeri pioneered percutaneous transcatheter valvuloplasty in Iran, an interventional procedure using a balloon to treat structural heart disease. He performs the balloon valvuloplasty to treat heart valve diseases, including mitral stenosis, by using percutaneous transcatheter mitral commissurotomy (PTMC or PTMV). For patients suffering from peripheral vascular disease, Nazeri Heart Center offers the full range of noninvasive and interventional vascular procedures to diagnose and treat without surgery. Peripheral vascular angiography, angioplasty, and stenting (with or without removal of the blood clot) for the major peripheral arteries is the mainstay of treatment for patients suffering from blockages of their arteries supplying blood flow to their legs, hands, and essential organs. We also offer endovascular aortic repair (EVAR) to treat the large aortic artery aneurysm in the chest and abdomen without surgery. Our structural heart disease team led by Prof. Nazeri, in collaboration with our world-renewed cardiac surgeons, routinely performs innovative transcatheter aortic valve replacement/implantation (TAVR or TAVI) to treat patients with aortic valve stenosis. This cutting-edge procedure corrects the narrowing of the aortic valve without surgery. Transesophageal echocardiogram (TEE) is a test that is performed by passing a flexible tube through your throat and food pipe (esophagus) to take images of your heart using ultrasound technology. Prof. Nazeri may advise this test if he needs to look at a certain area of the heart not usually visible with the regular echocardiogram, or if the images from your echocardiogram were unclear. This test is usually performed in the hospital setting.